Ralph’s Transmission has a new website, and you are on it right now. All of our old blog articles and information will still be available as always, but we are excited to have a new design and hosting service that will help us keep moving into the future. We hope you spend some time clicking through the pages and checking out the new site! Though we take a lot of pride in our history at Ralph’s Transmission (our transmission shop has been on 9th Street in Downtown Modesto since 1969 and has always been family-owned), we are always looking toward the future. The only way to keep growing is to embrace the latest technology and look for new ways to better serve our valued customers throughout the Central Valley. This new website is just one way we’re continuing to keep things fresh at Ralph’s. You may notice that the new RalphsTransmission.com also puts a lot of emphasis on trucks, SUVs and work vehicles. This is for a reason. We specialize in truck and large vehicle transmission services and repair. You may have seen our billboards around town saying “We Love Trucks!” because we do. 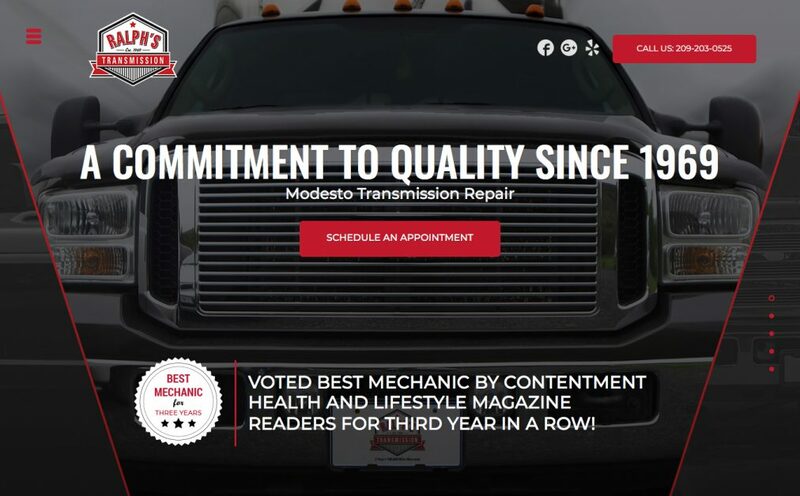 We’re all truck owners ourselves, and we love working on the trucks you depend upon every day—from farm and construction trucks to entire commercial vehicle fleet accounts. We also work with a lot of family SUVs, including popular models from Chevy, Ford, GMC and Dodge. If you’ve never been to RalphsTransmission.com before, welcome. We encourage you to click around and learn more about us, our shop and our services. We also hope you continue to follow the Ralph’s Transmission Blog and visit us on Facebook. If you have been to our website in the past, check out our new site and see some of the new things we’ve added and changed. Of course, if you have any questions about transmission repair or want to schedule a service appointment, call Ralph’s Transmission at 209.526.1909 or click here. You can also drop by our Modesto shop anytime Monday-Friday (8:00-5:00) and we’ll be happy to help. We can usually get your vehicle in for and inspection or repairs right away.